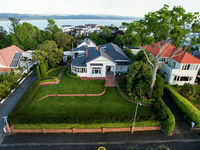 Located in the dress circle on top of Napier’s Bluff Hill "Cobden Villa" is a truly magnificent 524sqm home. It is unique, it is stunning, it is a home that flourishes when continually filled with family, friends, visitors and laughter. 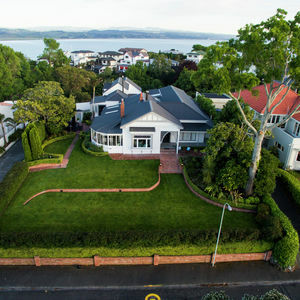 Large scale accommodation and private grounds are surrounded by mature plantings that beautifully frame the panoramic views both over Napier to Cape Kidnappers and the Ahuriri Estuary. Over the years both previous and current owners have undertaken substantial renovations and improvements which have enhanced what was already an outstanding residence to the exceptional property it is today. The attention to detail is superb and the craftsmanship totally in keeping with the character and style. Arrive through the ornate gate or folly and follow the recycled brick pathway to what you will discover is the heart of the home - A wonderful paved outdoor living space which adjoins large covered verandahs that can be accessed through French doors from both the family room and conservatory and the striking original cavity sliding doors of “The Whiskey Room” as it has been aptly named. Designed for year round entertaining whether it be family celebrations or large scale entertaining this home is perfectly attired. Open the front door and you will be immediately taken by the impressive hallway that connects the family living to four bedrooms and the formal living areas. Numerous living areas offer a multitude of options for harmonious family life, whether you are looking for a quiet spot to read or want to watch a movie in peace - everyone is well catered for. Spacious and separate, the formal lounge has a feeling of opulence while still remaining inviting and cosy. Built in window seats and bookcases, the original fire surround along with leadlight windows that attractively frame the stunning view really show off the character. Wander through the internal French doors to the conservatory – one of the most special rooms in the house. Glazed on three sides there is nothing to do but relax and soak up those views. Where else could you gaze out to Cape Kidnappers, watch the fireworks on New Year’s eve and catch a sunset on a warm Summer evening? The luxurious kitchen with full size scullery is a recent substantial renovation. In keeping with the style it can only be described as an entertainer’s dream. The Caesarstone island comfortably seats 8 and is a fabulous spot for both family dinners and informal get togethers. Beautifully polished timber flooring enhances the white joinery; pewter fashioned fittings and a stunning black tiled splash back complement the ‘state of the art’ appliances including full sized double oven, 8 burner hob and double ceramic butler’s sink - this kitchen is sure to impress even the most discerning. Incorporated into the sunny and light filled space is a very generous family living area with powerful wood burner, beautiful bi-fold windows, corner seat and views as far as the eye can see. An intimate deck off the kitchen catches the sun all year round and is the perfect place for your morning coffee. The glass balustrade overlooks the inviting heated magnesium pool with LED lighting and water blade fountain. The Northern wing leads from the kitchen and could be used as self-contained accommodation. Previous owners ran a popular luxury B & B and used the two bedrooms, bathroom and open plan kitchen living area for themselves while retaining the rest of the home for guest accommodation. Currently this area is the well-used ‘teenagers zone’ with direct access to the pool. The master bedroom is expansive with sash windows, a door to the rear patio and private access to the pool. It boasts a double set of wardrobes, room for comfortable chairs and an ensuite that is pure luxury. Stunning stained glass windows, double shower, raised bath, w/c, all encapsulated with beautiful tiles which lead out to its own balcony. Moving down the hall are three other considerable bedrooms, two with ensuite bathrooms. Altogether the six bedrooms in this home make it very family friendly. There are very few laundries you could describe as luxurious … but this home has one! It has been designed with custom joinery including individual laundry bins, built in ironing board, rack for hanging your ironed clothes, a butler’s sink and great bench space. All the light fittings, window dressings and floor tiles in this home have been individually chosen to complement each room. They are nothing short of stunning! The garaging and plenty of well-placed, concealed off street parking for guests is a wonderful extra. 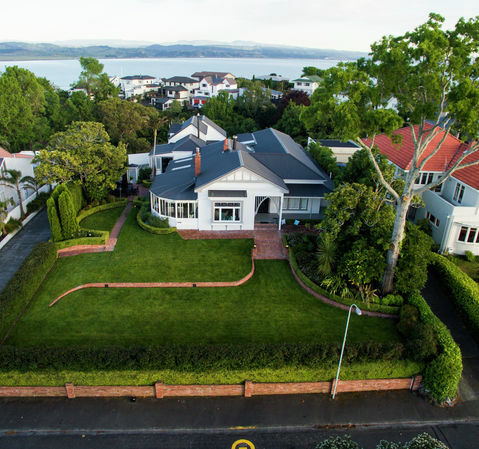 Manicured lawns, trimmed box hedges, topiary trees, clipped hedges, all mature and kept in the height of health over the hot Hawke’s Bay summer by pop up sprinklers add to the appeal of this property. Tenders close at Ray White office Napier, 209 Dickens Street at 4pm on Thursday 30th November 2017. Caroline Meo is a highly motivated and switched on professional, with a strong ethical passion, to always meet the high expectations and standards she sets. She has an infectious vibrant high energy, and an outgoing approach to life and a disciplined work ethic. Throughout her professional career she continues to demonstrate a superior level of personalised service to her clients. 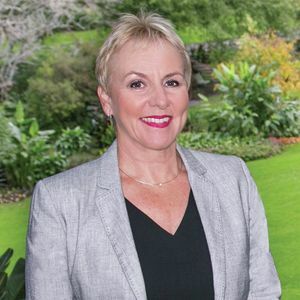 Recently taking the National Ray White Leaders 'ROOKIE OF THE YEAR' award, and Ray White Napier 'Top Agent' ,'Top Seller' & 'Top Lister' monthly awards numerous times proves she consistently works and fights hard to deliver top service with skill. Caroline is a sharp observer, and has the clever flair to notice fine attention to detail. She is a skilled negotiator and an avid marketer- she has the proven dedication and tenacity to always deliver. Raised in Napier, Caroline has a strong and proud devotion to her home town and carries a zeal for all it has to offer. She and was recognised and regarded for her running and sporting abilities growing up here, she is always on task and up to date with its changes, progressions and plans, and has developed an extremely large network of connections over the years from her school days, Otago University years, Wellington years, London years, and her 8 years back in the Bay. 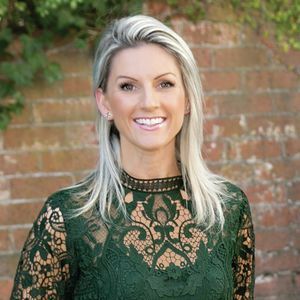 If you are looking for someone who works tirelessly to ensure she gets the best result, prides herself on extremely high standards and has the hunger and drive - then Caroline Meo is undoubtedly the person to market and sell your home.